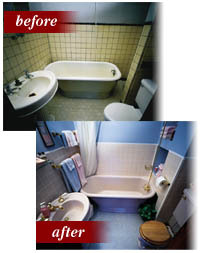 For an amazing new method of tile refinishing, residents should contact their local Perma-Glaze center. Perma-Glaze is an amazing new technology that can be used in a variety of ways around the house. If you've been considering giving your bathroom or kitchen a face-lift, then slow down a minute. Before you spend a fortune on brand new tile, find out what Perma-Glaze can do for your original surfaces. In 3 to 4 hours' time, your sink, bathtub, counter tops and more will look just like new. Perma-Glaze is made of an enhanced blend of polymer resins. When applied to worn or chipped tiles on your kitchen or bathroom floor, it quickly restores the damaged areas and resembles a shiny new finish. Not only is this process quick and easy, it can be done for nearly half of the cost of buying replacement tile. Avoid turning your bathroom or kitchen into a construction site for multiple weeks. Give in to your curiosity and give us a call today. For the latest innovation in tile refinishing, residents would be wise to visit Perma-Glaze. With an affordable and easy alternative to costly construction, you can't go wrong.